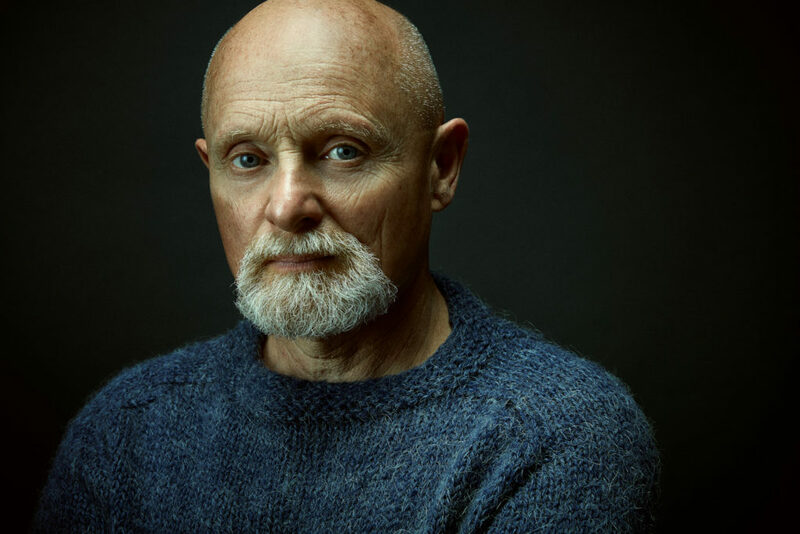 William Neil’s compositions present the listener with an intense brilliant effect (FANFARE MAGAZINE) and represents contemporary writing at its most intellectual probing (CHICAGO TRIBUNE). His extremely characteristic harmonic world (CLASSICAL CD REVIEW) is fundamental to the unfolding of his music. 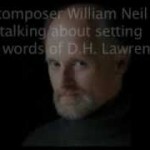 In the 1980’s Neil was appointed as the first composer-in-residence with the Lyric Opera of Chicago, the first residency of its kind with a major American opera company. His opera, The Guilt of Lillian Sloan was premiered by Lyric in June of 1986. He then went on to produce award winning concerts and events at the New Music Chicago Spring Festival for several years. His has composed music for celebrated musicians including John Bruce Yeh and Chicago Pro Musica, guitarist Michael Lorimer and soprano Barbara Ann Martin. His Rhapsody for Violin and Orchestra, commissioned by the Abelson Foundation, was premiered in Prague by the Czech National Symphony conducted by Paul Freeman has been recorded and released on the New Albany label. The Rome Prize and the Charles Ives Award are among his honors and his work has been recognized through grants from the National Endowment of the Arts, the Illinois Arts Council, fellowships from the Fulbright Commission and the American Symphony Orchestra League and awards from ASCAP and BMI. 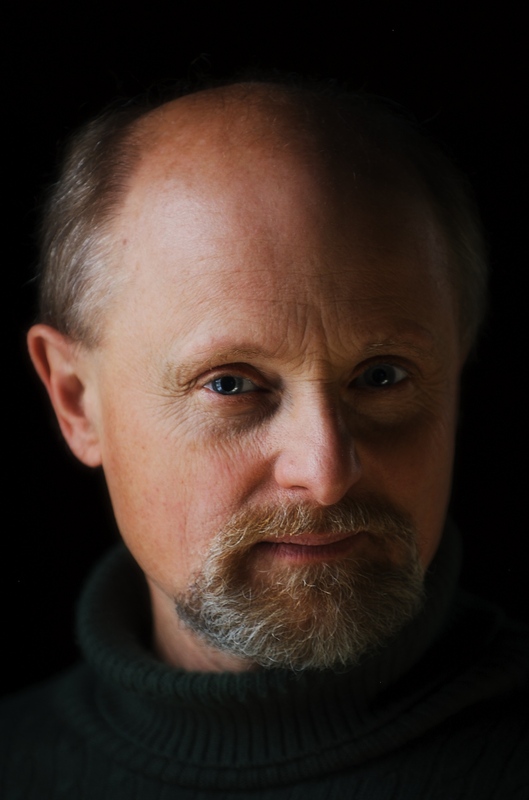 In 2008 he served as the McKnight Visiting Composer with the American Composers Forum for the city of Winona, MN. Trio Malipiero premiered his piano trio, Notte dei Cristalli, at the Teatro alla Specola in Padova in June. The La Crosse Symphony Orchestra, directed by Alexander Platt premiered his Symphony No. 1 (Sinfonia delle Gioie) in October of 2016 and the Pro Musica Ensemble commissioned and premiered Out of Darkness Into Light at the Cameron Art Museum in Wilmington, NC in March of 2017. Most recently, Italian pianist, Giacomo dalla Libera premiered Nocturne No. 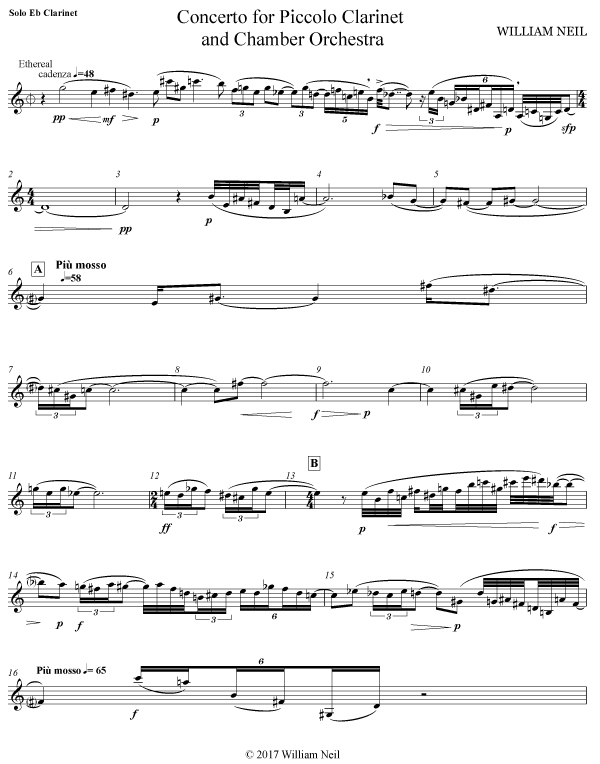 1, Prelude No. 3, and Tango No. 2 at Morely College in London and clarinetist, Fàtima Boix Canto’ premiered Concerto for Piccolo Clarinet and Chamber Orchestra at the Music Academy of the West in Santa Barbara, Ca. Recent CD releases have feature his music including Out of Darkness Into Light on Ravello Records and Spiritual Adaptation to Higher Altitudes on Mark Masters Recordings. His music will be feature on several live broadcasts on WFMT radio in Chicago in 2019 including his Six Tangos for solo piano performed by pianist Giacomo Dalla Libera and Six Preludes for piano solo by pianist Martin Jones. Neil is also involved with sound design for theatre and has also produced sound design for the In Tandem Theatre Company production of Beast on the Moon and The Glass Menageries in Milwaukee, WI. The music of William (Grosvenor) Neil (FAAR ’83) has been performed on both sides of the Atlantic and has been featured at the Festival of Music in Evian, France, the Electronic Plus Festival in New York, the Pontino Festival in Italy, and the New Music Chicago Festival. He has written works for celebrated musicians including Concerto for Piccolo Clarinet for John Bruce Yeh and Chicago Pro Music, recorded on the Newport Classic label, Fantasia, and Concerto for Guitar for guitarist Michael Lorimer, published by Melbay, Violin Rhapsody for violinist Sharon Polifrone recorded on Albany Records, and his songs set to poems by D.H.Lawrence, The Waters Are Shaking the Moon, for soprano Barbara Ann Martin, premiered on WFMT radio in June of 1996. In 1984 he was appointed the first composer-in-residence with the Lyric Opera of Chicago. His first opera, The Guilt of Lillian Sloan, was premiered in 1986. His orchestral works have been performed by the Grant Park Symphony Orchestra, The Chicago Chamber Orchestra, the Opus One Chamber Orchestra, Concertante di Chicago and the Czech National Symphony. Commissioned works include, The Waters Are Shaking the Moon for WFMT Radio, Rhapsody for Violin for Concertante di Chicago, Scherzo at the Speed of Light for Northern Kentucky University, Project Phoenix for Chicago Pro Musica, and Super String Quartet for the Arts Association of Denmark, At the Edge of the Body’s Night for Duo Sureno, Out of Darkness Into Light for Project FourthStream, and Sinfonia delle Gioie for the La Crosse Symphony Orchestra. Recent commissions and recordings include Oratoria for chorus and soloists composed for the St. Mary’s University Chamber Choir, Other Echoes Inhabit the Garden composed for Birds and Phoenix and the release of At the Edge of the Body’s Night recorded by Duo Sureno. Recent significant performances include Sleep for tenor, piano and digital acoustics performed at the Sound Scape 2009 Festival at the Vittadini School of Music in Pavia, Italy. 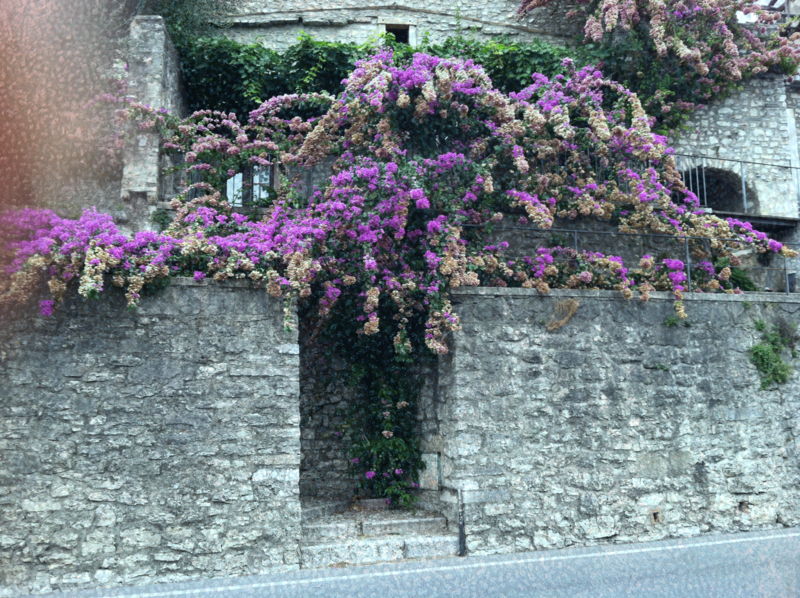 In September of 2012 he was in residence at the D.H. Lawrence Gargnano Centenary Symposium in Gargnano,Italy, performing his song cycle The Waters Are Shaking the Moon and a commissioned work, Where There is No Autumn. Most recently, Trio Malipiero premiered his piano trio, Notte dei Cristalli, at the Teatro alla Specola in Padova in June. The La Crosse Symphony Orchestra, directed by Alexander Platt premiered his Symphony No. 1 (Sinfonia dei Gioie) in October of 2015 this year. Forthcoming commissions include Out of Darkness Into Light for the Pro Musica Ensemble at the Cameron Art Museum in Wilmington, NC. Most recently, Italian pianist, Giacomo dalla Libera premiered Nocturne No. 1, Prelude No. 3, and Tango No. 2 at Morely College in London. Neil is the artistic director of TheComposerStudio.Com, LLC that specializes in film and sound design for theatre. Recently, he has produced sound design for the In Tandem Theatre Company production of Beast on the Moon and The Glass Menageries in Milwaukee, WI. He has also worked with the actor-director Phil Addis in designing sound for Nosferatu for the Viroqua Community Theatre. Recent film scores include the Community Conservation documentary Conservation of the Yellow Tailed Wooly Monkey. He also actively performs with Project Fourthstream as pianist, composer with jazz musician Tom Gullion. The duo recorded and produced their first recording, This Music in 2010. Recently the ensemble has successfully funded their project Nostras Voces: Out of Darkness Into Light through an Hatchfund.org crowd funding campaign. In June of 2016 he performed a solo piano recital of his own piano music, ” Verde, Bianca, Rosa Concerto” at the Academia della Musica in Sofia d’Epiro in Calabria Italy. He earned the Bachelor and Masters Degrees in Composition from the Cleveland Institute of Music & Case Western Reserve University where he studied with composer Donald Erb. He pursued advanced musical studies at the Staatliche Hochschule fur Musik, Koln, Germany and holds the Doctor of Musical Arts Degree in Composition from the University of Michigan School of Music studying composition with Leslie Bassett, William Bolcom, Eugene Kurtz and William Albright. His creativity has been recognised by awards from the McKnight Foundation (2008), the American Academy of Arts and Letters (1982), a BMI composition award (1981), an ASCAP award (1981), a Fulbright Fellowship (1978-1979), commissions from the National Endowment for the Arts (1978, 1984), an Illinois Arts Grant (1988), and the Rome Prize from the American Academy in Rome (1983). Most recently Neil was awarded a 2008 Visiting Composer’s grant from the McKnight Foundation for the city of Winona, MN. 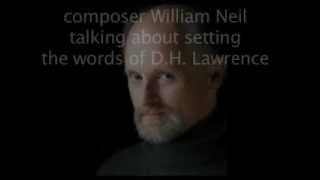 Interview with William Neil on setting the poems of D.H. Lawrence.